Hello all of my wonderful readers! I'm writing this post to let you know that there won't be a Fab Finds post this week or next week. I'm a bit overwhelmed with things to do at the moment. One of the projects I'm working on is making my blog into a book. Or should I say several books. I've chosen Blurb.com for this project. The choice was between Blog2Print.com and Blurb. With Blog2Print I found that I couldn't edit the text of my blog once it was slurped into their website. And I didn't like that, so I went with Blurb. I'm trying to get the first of my blog books finished before March 31st so I can take advantage of their 20% off sale. I have another reason for trying to hurry and finish this project. 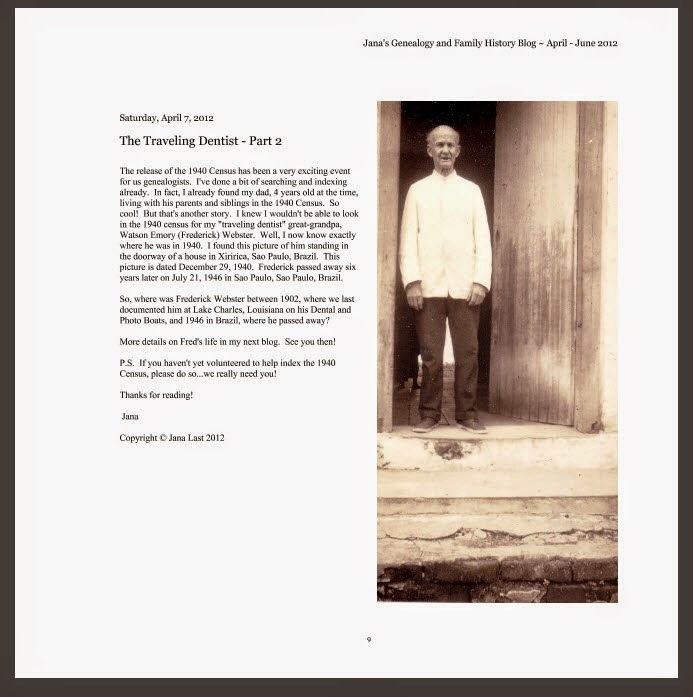 I would like to have my blog book printed and ready to show the class I'm teaching at our upcoming Family Discovery Day in May. I'll talk a little bit more about this event in a bit. First, I want to show you what my blog book likes like so far. Here are some screenshots. Because my book is still in draft mode, these pages may change. This is the book's front cover. I still haven't decided if this is the color I'm going to go with or not. And here are a few pages from the book. And this is the work space in Blurb. I do like Blurb's edit functionality. I can create my blog book to look pretty much exactly as I want it to look. But that means there's lots of work involved and it can be quite time consuming. I've gotten "Image Resolution Warnings" for a few of my photos. These photos were fine online in my blog, but wouldn't look very nice in my book. So, I've had to scan these photos again and upload them into Blurb. And I have to go through and edit my posts so they make sense in book form. For instance, I need to point the reader to the page number of a photo or document. Also, I'm planning on creating a Table of Contents, which I assume I will be doing by hand. 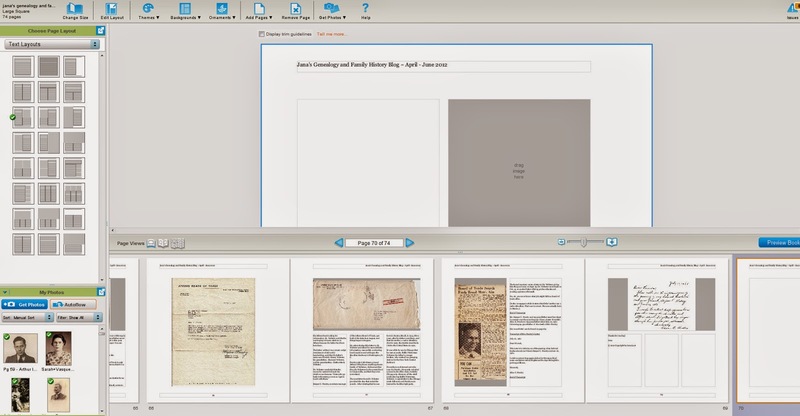 That's one feature I liked about Blog2Print. It creates a Table of Contents automatically. I also need to proofread the book before I press the order button. So ya. Lots to do still. I mentioned that I will be teaching a class at our local Family Discovery Day in May. That's another huge project I have on my plate right now. The syllabus for that is due on April 8th. I also need to continue working on my presentation which includes creating a PowerPoint slide presentation for my class. By the way, I was asked to give a presentation about Family History Blogging. How fun is that!? 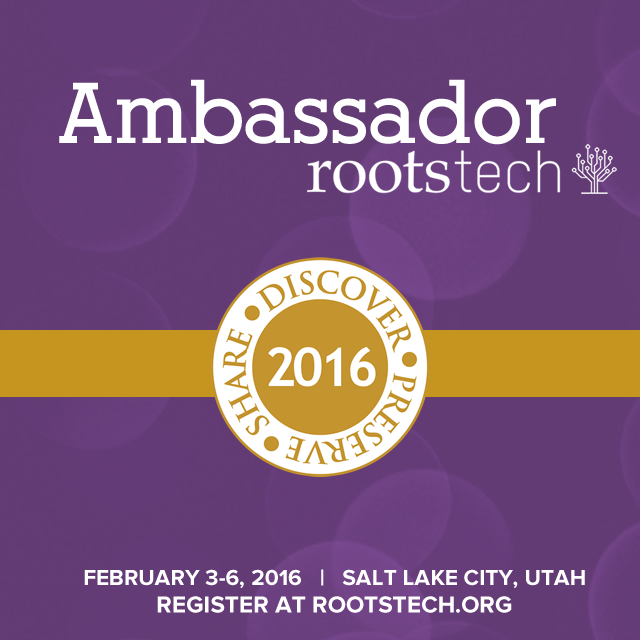 If you attended RootsTech this year either in person or virtually, you may know that they had a Family Discovery Day on the last day of the conference. 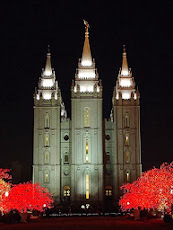 The wonderful people at RootsTech are providing selected RootsTech sessions for local Family Discovery Day events to be held around the world. Our local Family Discovery Day will have opening and closing general sessions and a variety of classes. To find a Family Discovery Day in your area, click HERE. Besides trying to finish my blog book and my Family Discovery Day class presentation, I also have my usual family and church responsibilities to take care of. So, something had to give. And I'm afraid it's going to be my Fab Finds posts for the next two weeks. My Fab Finds post should resume on April 10th. Note: This is a repost from last year's 52 Ancestors in 52 Weeks Challenge. I changed the title and made a few edits to make the post accurate for today's date. Happy Birthday Dad! We really do miss you! Today is my dad's birthday. He would have turned 79 years old. He passed away almost six years ago. 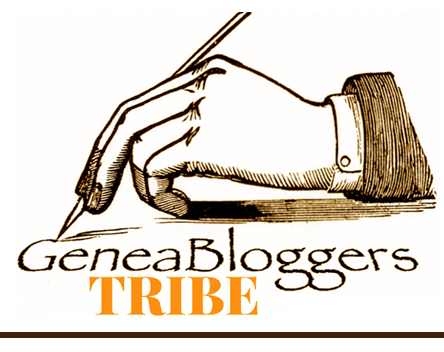 Sepia Saturday: A Scrapbook Finds a Home by Wendy Mathias, author of Jollett Etc. 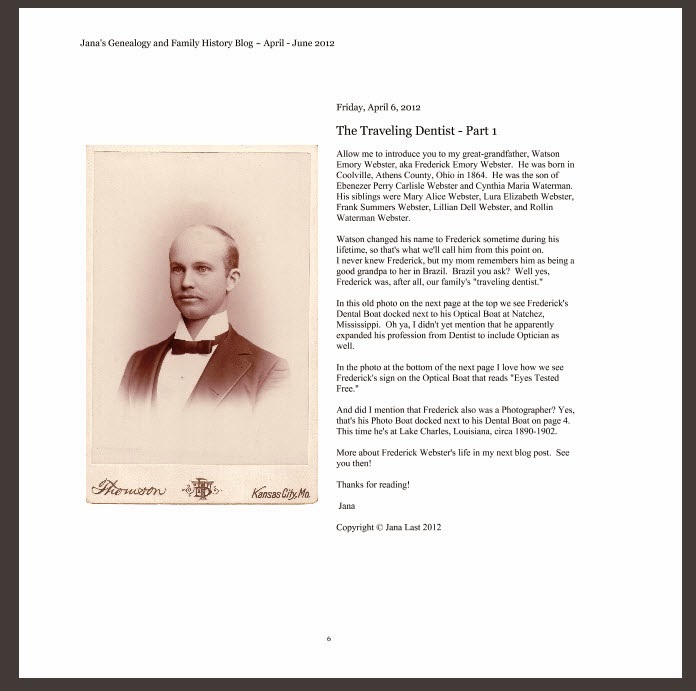 Last week I shared the Migration Record of my 2nd great-granduncle, Ole Iversen with you. That document was found in Norway's Digital Archives website. While I was doing research in that amazing website, I found the passports for Ole Iversen, his wife Anne and their daughter Guri. How exciting! Today I'd like to share Ole's passport with you. I'll share Anne's and Guri's passports in future posts. The full image above may be a bit difficult to read, so here's a cropped portion of the image showing Ole's information. I cropped the "Individual remarks" section of the document even further. As I mentioned in a previous post, I don't read or speak Norwegian. So once again I posted a translation request in the Norwegian Genealogy Group that I belong to on Facebook. And as before, I did get help. Two kind people responded. I was especially interested in this "Individual remarks" section of Ole's passport. It appears that this is a physical description of Ole Iversen. How cool is that!? With the help from the kind people in the Facebook group, here is the translation of the "Individual remarks" section. Individual remarks: of Nes, 65 Tommer = inches tall (5'5"), undersat could mean stocky build, blaa means blue which must refer to Ole's eye color, and morkebrunt = dark brown which must refer to Ole's hair color. We don't have a photo of Ole, so reading this physical description of him is really wonderful. Ole and his family immigrated to the United States in April of 1858. The Migration Record for Ole and his family didn't have a specific date. It only had April in the date column. 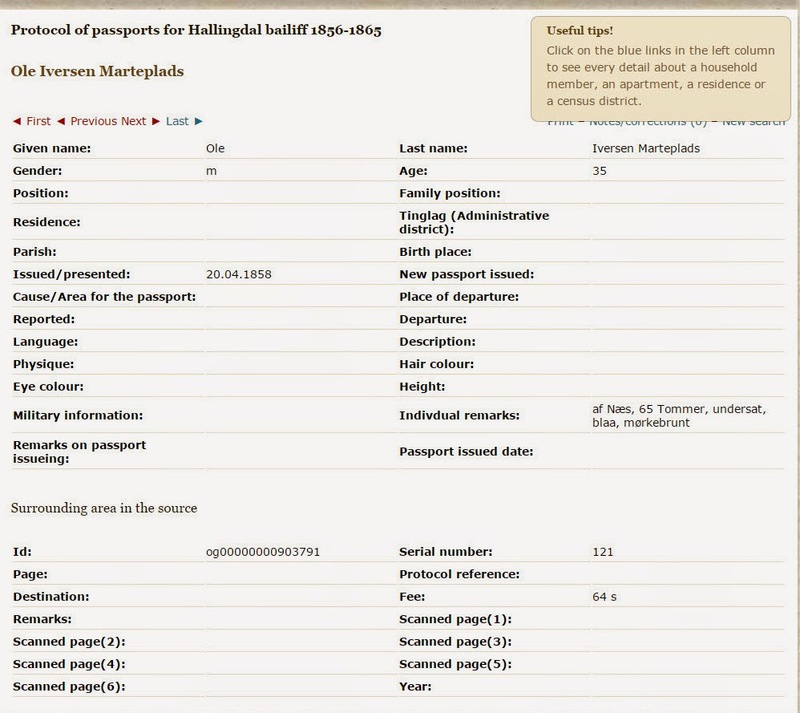 Since Ole's passport was issued on 20 April 1858, this tells me they left Norway sometime after that date. Norway's Digital Archive is such a wonderful website. If you have Norwegian ancestors, I highly recommend giving it a try. 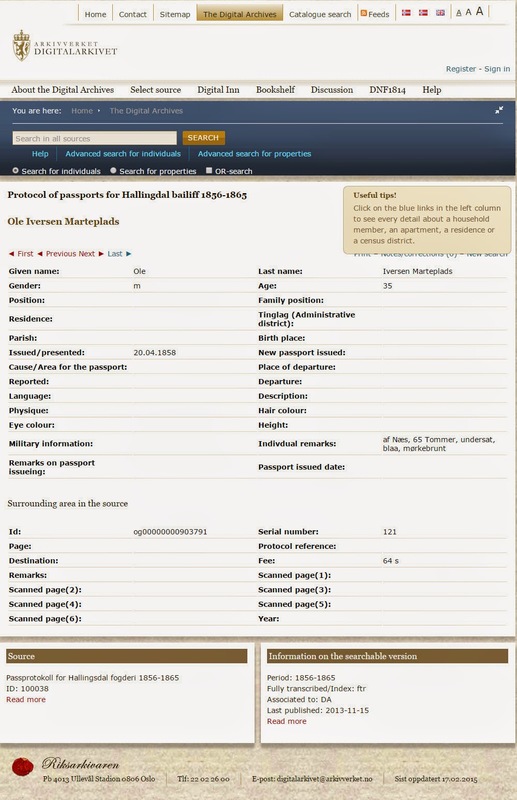 And, if you'd like to access the passports section of Norway's Digital Archive, click HERE. Iver is listed inside the blue rectangle on this page and Ole and his family are inside the red rectangle near the bottom of the page. Before we look at the information about Ole and his family in this document, I'd like to tell you a little bit about them. Guri was only about a year old when Ole and his young family immigrated to the United States. What must it have been like for them to make this long voyage across the Atlantic Ocean in 1858? I can only imagine how difficult it must have been for them. Let's look at the information in the Migration Record. I don't speak or read Norwegian, so reading some of the words in this document was a bit difficult. Here's a cropped view showing Ole and his family in the Migration Record. I couldn't figure out what some of the words were in these columns, so I asked for help in two of the Norwegian Genealogy groups that I belong to on Facebook. I uploaded these images and posted my query. Within half an hour two kind and helpful people from one of the groups translated the words in the document for me. I was told that the word in front of Ole's name is an abbreviated form of "husmann" which means tenant farmer. And I was told that the word in front of Anne's name is "hustru" which means wife, and that the word in front of Guri's name is "barn" which means child. Ole and Anne had two more children after they arrived in the United States. Here's the complete list of their children. Ole's parents, Iver and Guri, and his brother Christopher, immigrated to the United States in 1861. I will be sharing their Migration Record in a future post. My paternal 2nd great-grandfather, Iver Iverson, was born in Marteplads, Nes, Buskerud, Norway on 2 August 1827. Research that I inherited from my dad stated that Iver and his brother Ole immigrated to the United States in April of 1858. 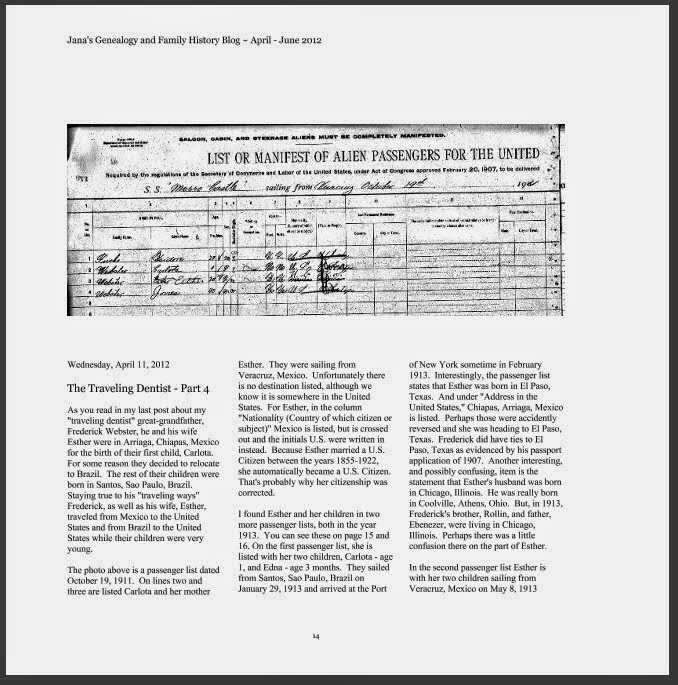 Last year I downloaded a digital copy of an immigration record that shows that they did emigrate from Norway in April of 1858. "My great grandfather immigrated from Marteplads, Nes, Buskerud, Norway sometime between 1850 and 1860. He came to America and fought in the Civil War with the Iowa Regulars. He settled in Benson, Minnesota. I am looking for a passenger list and immigrant list showing him as an immigrant from Norway. Any pointers would be appreciated. Thanks." My dad passed away almost six years ago. To find his query while I was writing this blog post was bittersweet. 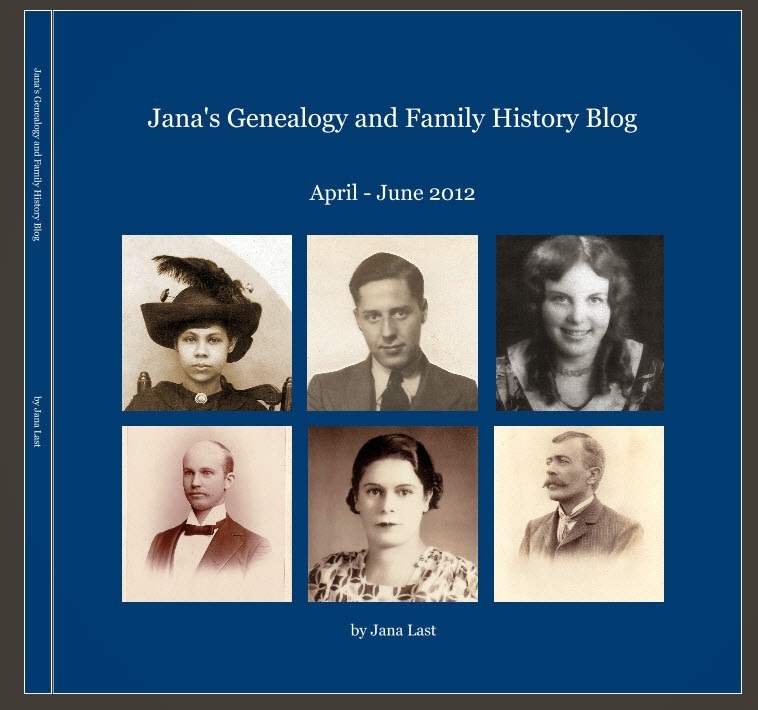 Before my dad passed away, I focused my family history research on my mom's family lines. But now I'm researching my mom's and my dad's family lines. In my dad's query from 2004 he didn't seem to know exactly when Iver had immigrated. After posting his query he must have found the answer he was looking for. I copied some of his research notes from his genealogy database into mine. And the notes he had for Iver Iverson indicate that he found the date of Iver's immigration from looking at a microfilm of parish records for Nes, Buskerud, Norway (film 278204). It's amazing that today I can just look online and find that information. This document is found in The National Archives of Norway website. This website is absolutely wonderful. If you have Norwegian ancestry, I highly recommend it to you. It's free to access, which is awesome. Iver Iverson (spelled Iversen in Norway) is found on page 593, line 30. Iver's entry is inside the red rectangle. I cropped Iver's entry to get a better view. And here's the information found within this record. 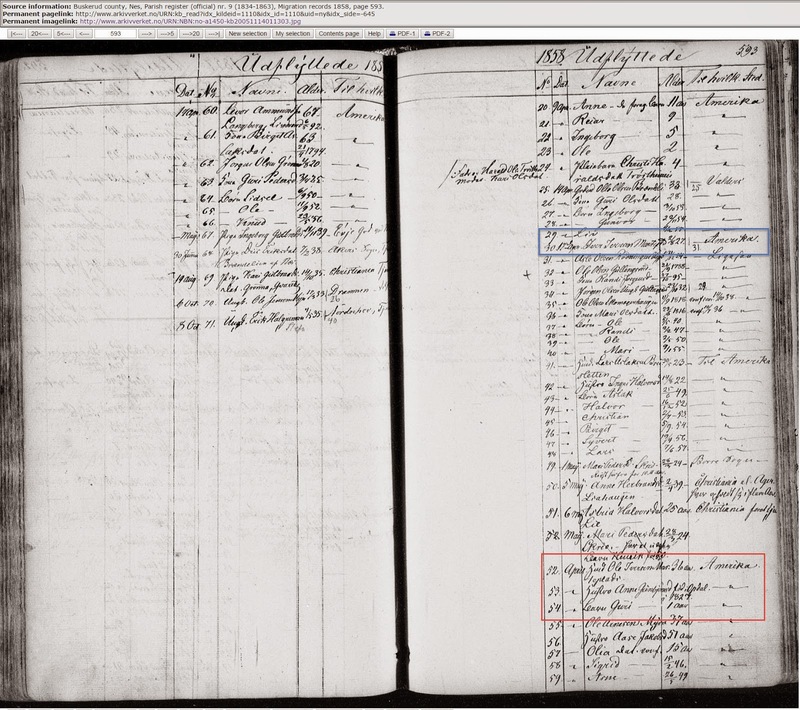 In a blog post last week, I mentioned that I have digital copies of immigration records for Iver's brothers Ole and Christopher, as well as for his parents Iver and Guri. I'll be sharing those records in future posts.